Get the New Biking and Hiking Trail Map! 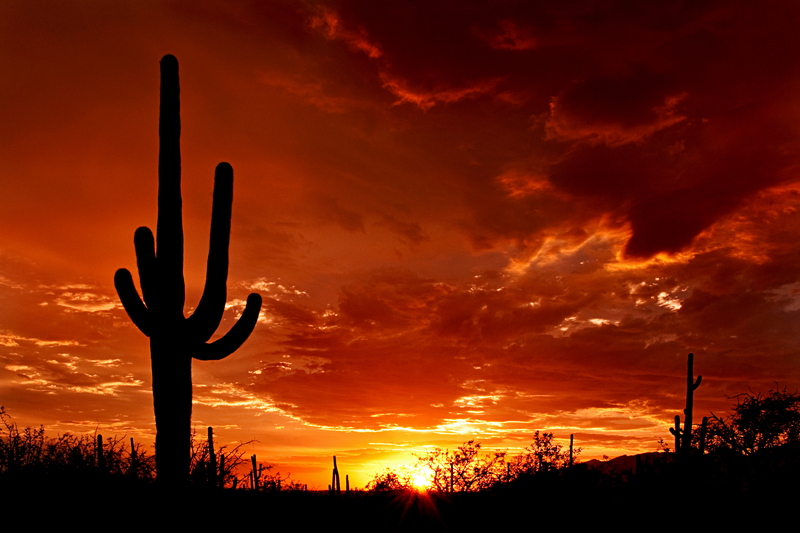 We are lucky to have one of the nation’s most treasured parks, Saguaro National Park, right in our backyard. Find out everything you need to know about visiting Saguaro National Park while you are in Marana, Arizona. Saguaro National Park consists of two distinctly different parks, located within two different mountain ranges that are on opposite sides of Tucson, Arizona. 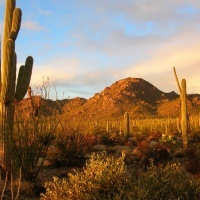 Marana is closest to Saguaro National Park West and the eastern side of the park is located just one hour away by car. Saguaro National Park West is also known as Tucson Mountain Park because it is located within the Tucson Mountain Range. The west side of the park covers about 25,000 acres and stretches from the Arizona-Sonora Desert Museum, at its southern edge, to the Town of Marana, at its northeast corner. Saguaro National Park East, encompasses the Rincon Mountain Range and is also known as the Rincon Mountain District. It is in the vicinity of two major Southern Arizona attractions, the Arizona-Sonora Desert Museum (world-renowned zoo and botanical garden) and Old Tucson, the 1930s movie set and location of scores of films and TV shows, now a delightful family-oriented Western theme park with things for big and little kids. Can I visit both Saguaro National Park West and East in One Day? Both The West and East areas of the park offer very different experiences. If you do have the time, we recommend visiting both areas of the park. Both are convenient and accessible from Marana, AZ. The West side of the park offers many scenic “oohs!” and “ahhs” having some of the largest stands of saguaro cactus in the world, which you can enjoy as a hiker, photographer, or from picnic tables or your car. The East side also has scenic drives and is geared more to hiking. The East side is in a completely different mountain range than the Saguaro National Park West, and it has pine forest, much higher elevations, and a number of campgrounds that are accessible only to hikers. 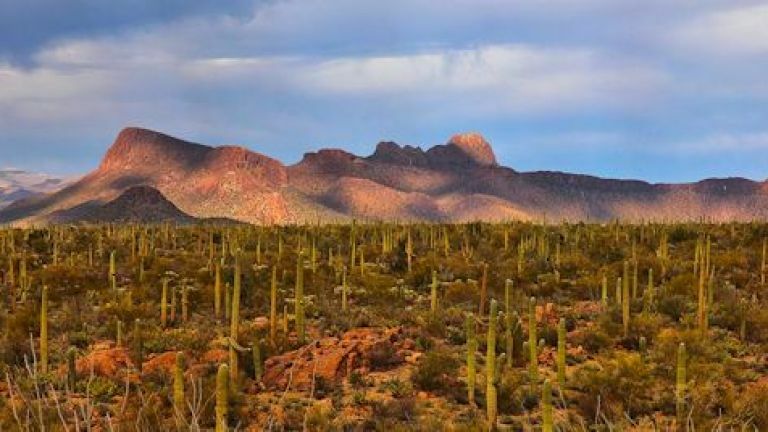 If you have one day, Saguaro National Park West is close by and easy to see the iconic saguaro forest desert landscape, and one or two major area attractions (Arizona-Sonora Desert Museum and Old Tucson) in one visit. 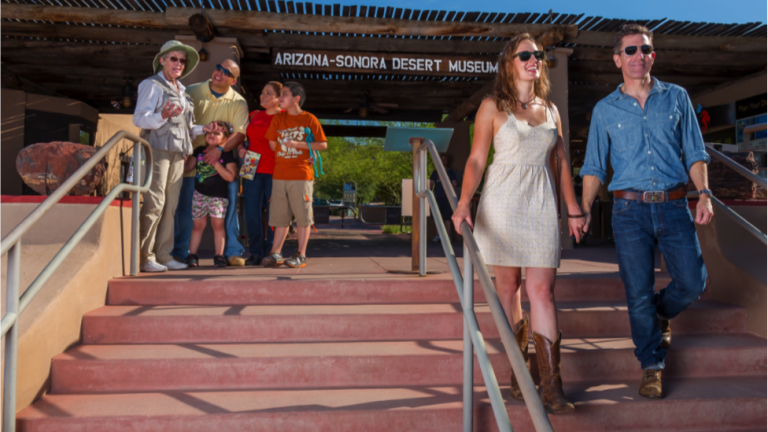 Where is the Saguaro National Park visitor center located? The Red Hills Visitor Center is about 27 minutes from the I-10 freeway at the Cortaro Road exit in Marana. From Cortaro Road, it’s a short jog over the Tucson Mountains into Saguaro National Park West. 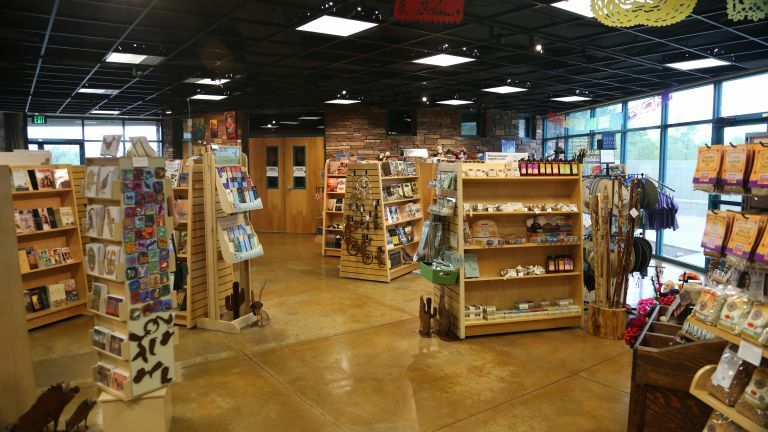 At the visitor center, you will find a bookstore, interpretive exhibits, movies to watch, trails, restrooms, and friendly park rangers to answer any questions you may have. Saguaro National Park West in the Tucson Mountain District is open to vehicles from sunrise to sunset daily. You can walk or bike into the park 24 hours a day. The visitor center is open 364 days a year and closed Christmas day. Saguaro National Park East is open to vehicles from 7 am until sunset daily. You can walk or bike into the park 24 hours per day and the visitor center is open every day except for Christmas. What is the best time of year to visit Saguaro National Park? November through March are popular months for visiting because temperatures are mild, ranging from the high 50s to mid 70s Fahrenheit. If you are looking to see cactus and wildflower blooms, the bloom season begins around February and March and the Saguaro cactus flowers begin to bloom around late April. Can you see Saguaro National Park in one day? If you only have one day to explore, we recommend visiting Saguaro National Park West and driving the scenic six-mile Bajada Loop Drive. This drive allows you to see the park’s iconic Saguaro cacti, spot some wildlife, and take in rolling views of desert mountains and valleys. What makes Saguaro National Park and its iconic cactus so special? Saguaro National Park West has some of the prettiest desert landscapes and the largest and most expressive cacti you’ll see anywhere on earth. Containing both desert floor and uplands, Saguaro Park West has hillsides covered with saguaro cactus. 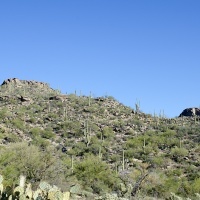 The uniquely folded mountain range running through the park creates an ideal microclimate for the saguaro forest to thrive. The elevation ranges from 2,180 ft. to 4,687 ft. and includes two bioclimates: desert scrub (desert floor) and desert grassland (upland). The saguaro has different columnar variations: crested saguaros are rare and quite striking looking, some saguaros have no arms, some have many arms, not all arms point upward, and saguaros can grow to be 40 feet tall. Saguaros are habitat for many types of winged creatures and the cactus wren makes its home inside of holes in saguaros. 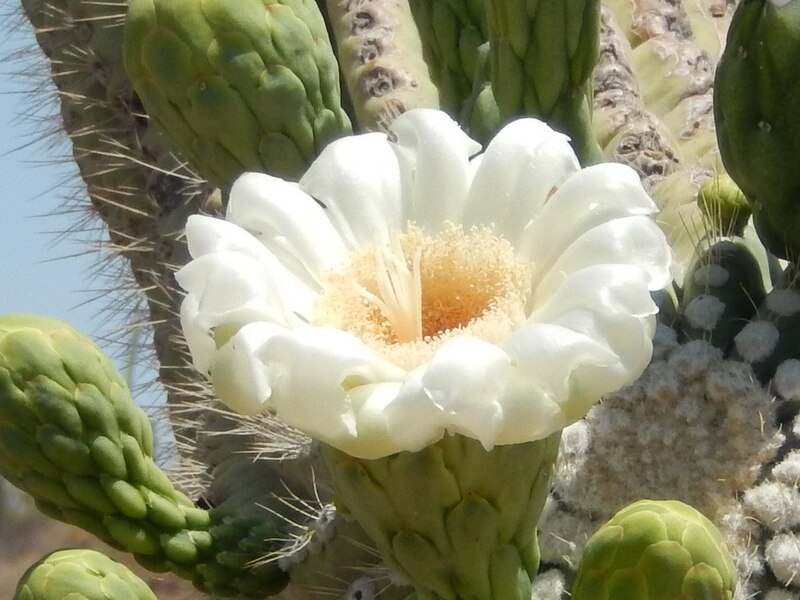 When does the saguaro cactus flower? The Saguaro Cactus Flowering season extends from late April through July. Saguaro flowers are exotic and delicate. They are the lotus flowers of the desert. They typically flower over a few months and their pollinators include bees, bats, white-winged doves, hummingbirds, orioles, woodpeckers, flickers, verdin, and house finches. Learn more about saguaros here. 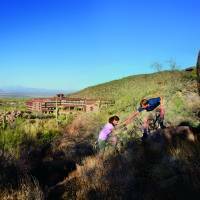 What are the top things to do in Saguaro National Park? Tour the Bajada Loop Drive in Saguaro National Park West for a great overview of the park and sweeping mountain, and valley views. Everywhere you look, you’ll see hillsides studded with majestic saguaro cacti. 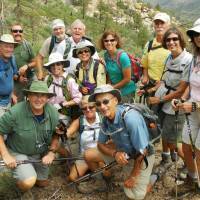 Stop at a picnic area or trailhead to get out and explore on foot. In Saguaro National Park East, the paved eight-mile Cactus Forest Loop offers amazing views of the nearby Rincon and Santa Catalina Mountain Ranges and the entire valley as well. The park offers more than 165 miles of trails ranging from easy nature trail hikes for beginners or families to full day-long wilderness treks and overnight adventures. On the western side of the park, the Valley View Overlook Trail is a popular choice offering a short hike with a stunning scenic view. Visit the Saguaro National Park hiking page to view trail maps and learn more. Many visitors enjoy biking the park’s scenic loops. The Bajada Loop Drive in the West side of the park is a six-mile gravel path, perfect for mountain bikes. On the East side of the park, visitors can tour the paved eight-mile Cactus Forest Loop Drive on a mountain bike or a road bike. For more information on biking through the park, please visit the Saguaro National Park biking page. The astounding petroglyphs in Saguaro National Park West date back hundreds of years to the ancient Hohokam people. You can view a solar spiral petroglyph, and many others in Saguaro National Park West by following the Signal Hill Trail. It is a gentle climb to get up to the hill where you will find dozens of ancient markings. Where can I find maps of the park? What are the top trails to explore in Saguaro National Park? 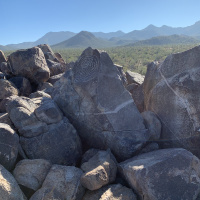 In the Tucson Mountain District (West) Signal Hill Petroglyphs Trail is a must see. 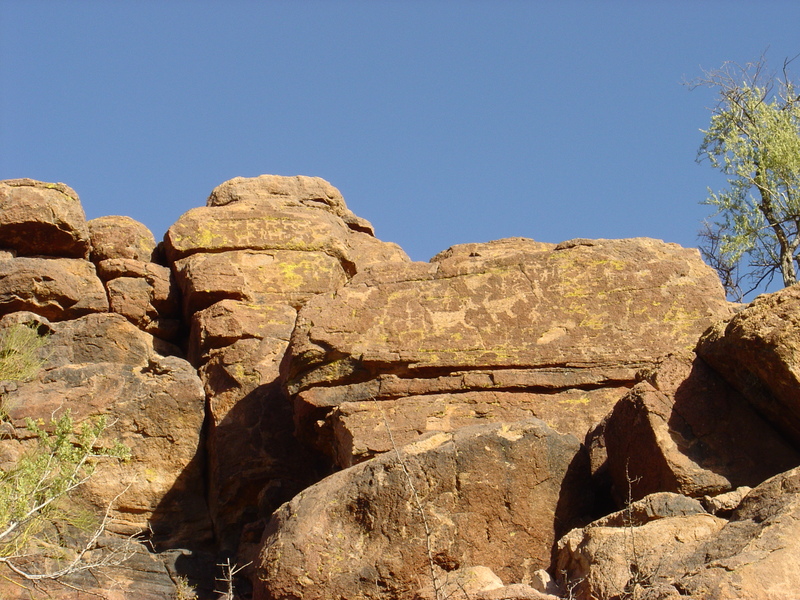 It’s an easy half-mile hike up a gentle hill and this trail rewards hikers with dozens of ancient petroglyphs. Another popular choice is the Valley View Trail, which offers gorgeous views of Avra Valley and Picacho Peak to the north. Mica View Loop in Saguaro National Park East is a two-mile round trip hike featuring views of Tanque Verde peak and Mica Mountain. For a curated selection of top trails to explore, visit the Friends of Saguaro National Park website. Where is the best place to watch a sunset in the park? With the sun setting behind the Tucson Mountains, you really can’t go wrong as far as watching a sunset in Saguaro National Park. Visit picnic areas in any part of the park (East or West) and you’ll see just how stunning the 360-degree views of a Sonoran Desert sunset can be. What kinds of wildlife can I see in the park? Many different species of birds, amphibians, and mammals call Saguaro National Park home. Look for roadrunners, horned lizards, kangaroo rats, and the cactus wren. On the eastern side of the park, at higher elevations visitors may encounter black bears and white-tailed deer as well. To learn more about all the amazing wildlife you may experience throughout the park, visit the Saguaro National Park page on wildlife. Can you visit the park at night? The park closes to vehicles at sunset, but visitors may walk or bike into the park 24 hours a day. Stargazers and night sky photographers will frequent the park, known for dark skies and good visibility. Check the park’s event page for upcoming evening hikes and stargazing activities. Can you camp in or near Saguaro National Park? Backcountry camping is available to backpackers only (no vehicles or RV camping is permitted). There are six campgrounds throughout the park and a permit is required for all camping stays. 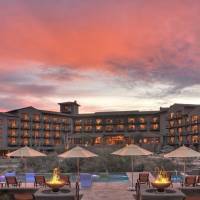 Where can you stay near Saguaro National Park? Make Marana, Arizona your base camp for exploring Saguaro National Park and the entire Sonoran Desert region. Marana offers a range of accommodations from family-friendly motels to luxurious resort lodging. Learn more on our where to stay page. Marana and neighboring Tucson, Arizona offer so much to do and see. Close to Saguaro National Park West, visitors may wish to stop by the Sonoran Desert Museum, where you can learn more about desert plant and wildlife. 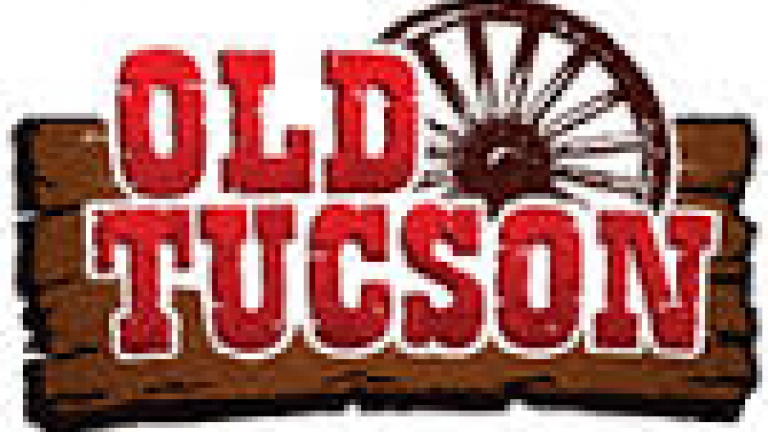 Families will also love visiting Old Tucson Studios, which offers a step back in time to the old west with fun activities and tours. Check out our things to do page for even more inspiring ideas for your stay. Are there guided tours available? Park rangers offer ongoing tours, events, and activities. This is an excellent way to learn more about the desert’s unique ecosystem and engage with seasonal changes in the park throughout the year. Find fun and educational activities for your family on the park event page. 1933 Saguaro National Monument first created by President Herbert Hoover. 1994 Saguaro National Monument elevated to a National Park status. 1 - 1.5 inches. Amount a saguaro grows in the first eight years of its life. 50 to 70 years. Age when saguaros typically grow their first arms. 35 years. Age when saguaros start to produce flowers. 6 tons and 50 feet. Size of an adult saguaro. 150 - 175 years. Average lifespan of a saguaro, with some living to be more than 200 years old. 550 - 1550 years. Approximate age of petroglyphs in Saguaro National Park. 165 miles of hiking trails throughout the park. 10.27 inches. Annual average precipitation in the Tucson Mountain District. 12.30 inches. Annual average precipitation in the Rincon Mountain District. 2,000 - 4,600 feet. Elevations in the Tucson Mountain District. 2,600 - 8,600 feet. elevations in the Rincon Mountain District. 25,000 acres of land to explore in the Tucson Mountain District. 57,930 acres of accessible backcountry wilderness in the Rincon Mountain District of Saguaro National Park. What is the history of the park? In the 1920s, naturalists at the University of Arizona started to express interest in preserving iconic plants like the saguaro cactus. Stakeholders began to campaign to promote conservation efforts and the land was officially designated a National Monument in 1933 with a Proclamation signed by President Herbert Hoover. In 1994, Congress made Saguaro into a National Park. 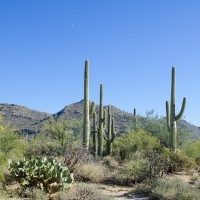 To learn more about Saguaro National Park’s history, visit the official park website. Need ideas for your upcoming trip? Pssst. Are you listening? Come in a little closer. We’ve got a secret, but you have to promise not to tell. Do you promise? Pinky swear? Alright, pay attention. Marana is synonymous with the outdoors. With close proximity to a National Park, and several mountain ranges, there is plenty to do within the Town limits. Those who really want to explore with find several more state and national parks just a short car ride away. Here are our top three hiking adventures in and around Marana.